Thanksgiving is this week! If you’re still looking for a new dish,something new or some new ways to think about this holiday, a Three Sisters side dish for Thanksgiving may be for you! Not only is it delicious, but it is a nod to centuries of American Indian agriculture and cooking and to begin a better and deeper understanding of indigenous people in the Americas both today and in the past. The three sisters refer to the crops of corn, beans and squash, which grow together in ways that mutually benefit all three crops, better than each would grow on it’s own. This combination is known to be THE crop for most of the Americas (originating in what is now Mexico) and moving throughout the continent over the centuries. Different types of beans and winter squash were grown and eaten throughout North America, this recipe uses butternut squash (because we always have a couple of those hanging around this time of year and they are grown locally!) and canned green beans along with frozen corn (but you could always use fresh green beans or other beans…Carpinito Brothers in Kent still has fresh, locally grown green beans as well as corn!). For other ideas to eat local on Thanksgiving in Seattle, check out this previous post. If you’re interested in learning more about the world of decolonial cuisine and a deeper connection with our food, check out this fantastic article. Enjoy! Happy Holidays! 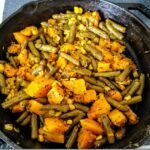 A delicious blend of corn, green beans and butternut squash (the three sisters) to enjoy for Thanksgiving or any other day! Steam the butternut squash for about ten minutes (or, to make it a one pot meal, sautee the butternut squash chunks in a cast iron skillet or frying pan, this will make it a bit firmer). Heat the cast iron skillet (or frying pan) with olive oil and sautee the frozen corn (if you also sauteed the butternut squash then just add the oil to that pan). Once the corn and squash are roasted, add the cans of green beans (if using fresh steam them a bit first) to the pan. Add the italian seasoning and a bit of salt and pepper. Sautee the whole thing up for a few more minutes till it’s steamy and delicious! Enjoy! 3 Ways to Get Outside this Black Friday!